The winners of the Oranje Handelsmissiefonds (Orange Trade Mission Fund) open the Amsterdam exchange by sounding the gong. The Oranje Handelsmissiefonds was established 5 years ago by ING, KLM, MKB-Nederland and the Dutch Ministry of Foreign Affairs to open doors in foreign markets. Each year, ten companies win guidance and support from the five Oranje Handelsmissiefonds partners. This year of support has as its target to put the Netherlands on the map as an export country, and to help entrepreneurs with their export ambitions. This year’s ten winners will receive help in realizing their international ambitions during this fifth year of the fund. Evi van Lanschot, part of Van Lanschot Kempen (ticker symbol: VLK) has been named the best online asset manager in the Netherlands for the second year in a row by the professional jury of the “Gouden Stier” (Golden Bull) award. To celebrate this, Evi opens the Amsterdam exchange with the traditional gong ceremony. Evi is an online asset manager that makes investing accessible to everyone. 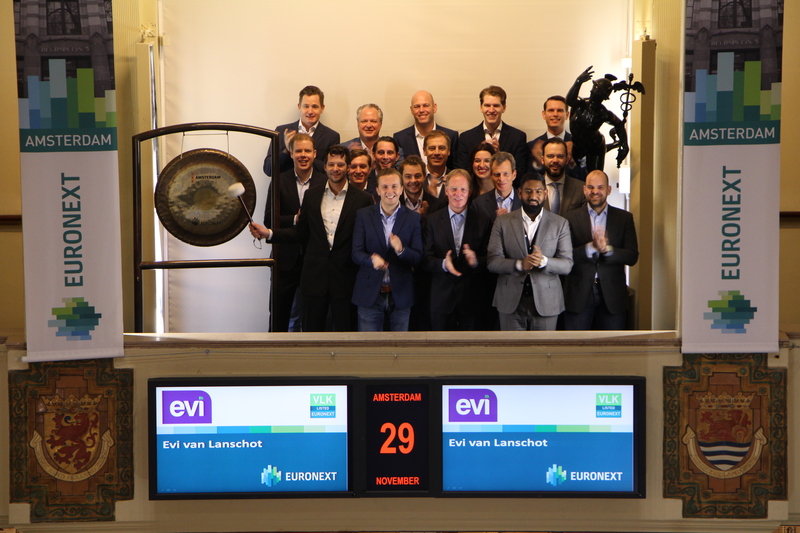 Evi manages more than € 1.5 billion in assets in the Netherlands and Belgium. 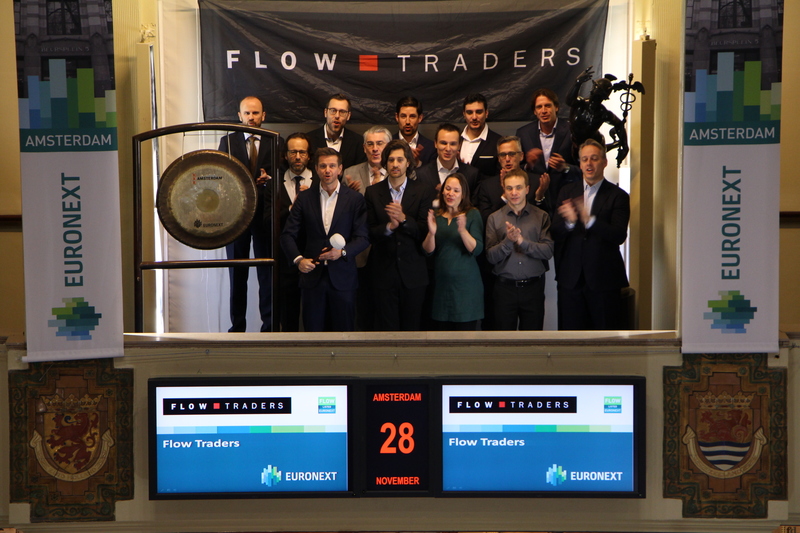 Flow Traders (ticker symbol: FLOW), listed on Euronext’s Amsterdam exchange, visits Beursplein 5 to highlight its developments in the field of FX market making. Robbert Sijbrandij, Head of FX, sounds the gong. In its capacity as a leading global market maker in ETPs, Flow Traders has built up a great deal of experience in FX trading as part of its hedging strategies. As of today, the company is connected to FastMatch’s platform, and is therefore able to offer quotes in FX directly to investors. Flow Traders has the ambition to become a defining market maker in FX, this step fits into that development. Recently, more than 250 innovative startups from all over the Netherlands came to Rotterdam for Get in the Ring. The day was closed by the award show where 6 startups took the stage to get maximum visibility and connect with a big audience. 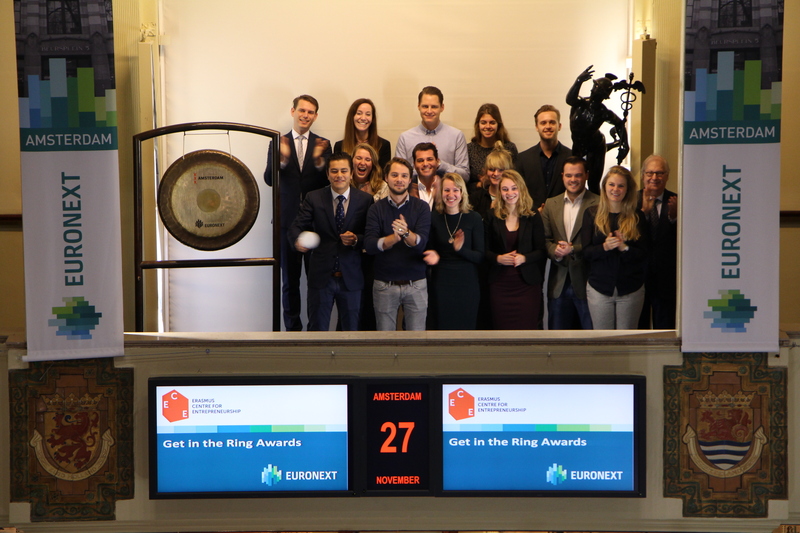 The winning startups of the Get in the Ring Awards 2017 sound the gong on Euronext’s Amsterdam exchange. The winning startups Kozie, LABFRESH and Convious received a ticket to the Global Meetup of Get in the Ring. Get in the Ring the Netherlands was organized by the Erasmus Centre for Entrepreneurship (ECE), supported by the City of Rotterdam and EY, and part of a worldwide network of the Get in the Ring Foundation. Annually 150 events in 100 countries are organized and of which the winning startups of all these events worldwide will meet in Cascais, Portugal, from 30 May to 1 June, during the Global Meetup. The Amsterdam exchange is opened by the KAS Lab. Otto Hulst, Innovation Lead of KAS Lab sounds the gong. KAS Lab is a meeting place and testing ground where innovative ideas are thought out. Internal and external innovators work together to turn an innovative idea into an innovative solution. 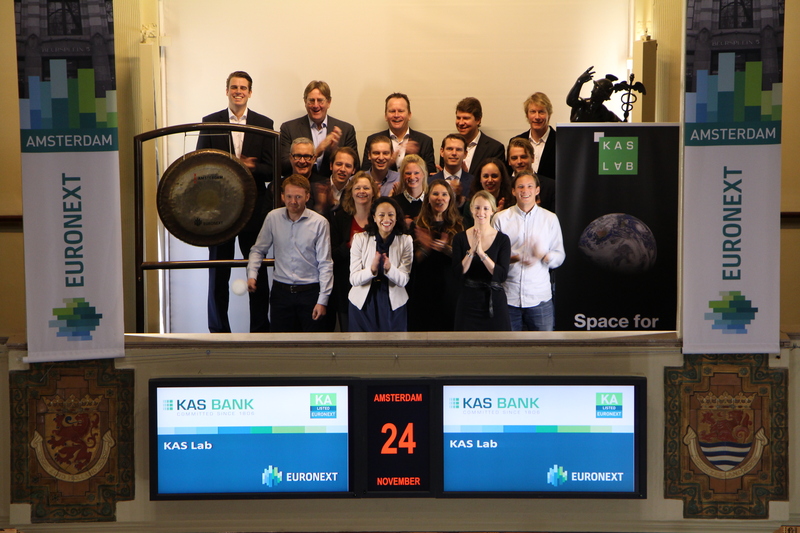 "The establishment of KAS Lab is part of our strategic priorities and enables us to better respond to current changes in the financial sector," says Sikko van Katwijk, Chairman of Management Board at KAS BANK. Otto Hulst, KAS Lab's Innovation Lead: "KAS Lab offers many opportunities to explore all sorts of ideas, ripe and green, in a creative way and develop them further. Thanks to the close cooperation of internal specialists, external innovators and customers, an innovative solution can be developed quickly and the success ratio is increased. " 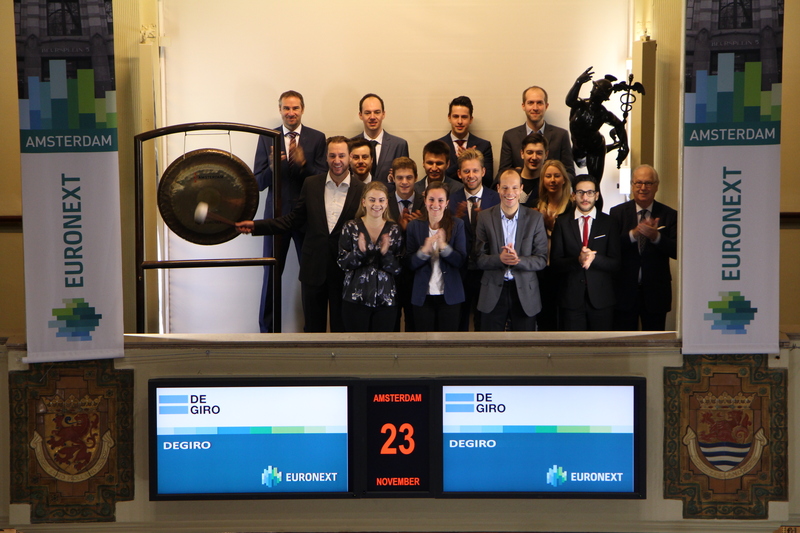 DEGIRO opens trading for winning their second “Gouden Stier” (Golden Bull) award. Bart Korteweg, Head of Prof. Services, sounds the gong. According to the expert jury, DEGIRO is the best choice for the average investor. DEGIRO won the award, partly because price information at DEGIRO is free, while investors pay for it at other brokers. DEGIRO also has an advantage in terms of currency costs. Because costs make a substantial difference for investors, the professional jury chooses DEGIRO as winner. DEGIRO, an online investment platform and broker, was established in 2008. DEGIRO enables business and private clients to invest globally at unprecedentedly low rates. In the coming years, DEGIRO wants to become the largest online broker in Europe measured in number of transactions. DEGIRO is supervised by the Dutch Central Bank (DNB) and the Dutch Authority for the Financial Markets (AFM). Fund and asset manager ACTIAM sounds the gong after announcing they will be continuing the successful SNS funds under its own brand name. In addition, the asset manager will further expand its range of ACTIAM funds for private investors. The responsible funds have a competitive cost structure and a solid performance track record. ACTIAM is the leading responsible fund and asset manager for more than one million people in the Netherlands, with 54.1 billion euros in assets under management as at the end of June 2017. ACTIAM offers a full range of investment funds and investment solutions –from index funds to impact investing. ACTIAM sets stringent requirements for its investments and applies a strict, careful selection process, without making concessions as far as financial returns are concerned. ACTIAM is at the forefront here, giving it an edge which it continuously works to maintain. 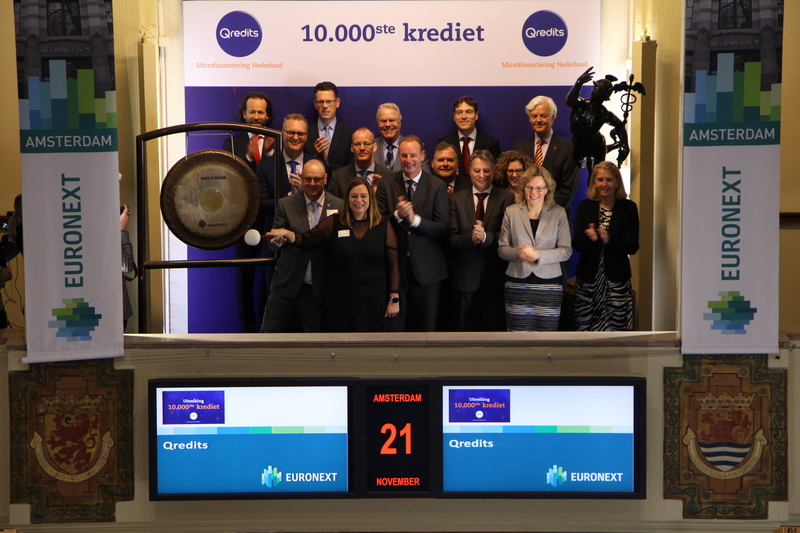 The entrepreneurs who receive Qredits's 10,000th credit open the trading day at Euronext’s Amsterdam exchange. They do this accompanied by, amongst others, Klaas Knot, president of DNB. Since its establishment in 2009, Qredits Microfinance has made name for itself in the financing world. Qredits helps entrepreneurs to successfully start and invest in their business. The organization provides credits up to € 250,000, and offers coaching and convenient online tools. Everything to help the entrepreneur with their entrepreneurship. 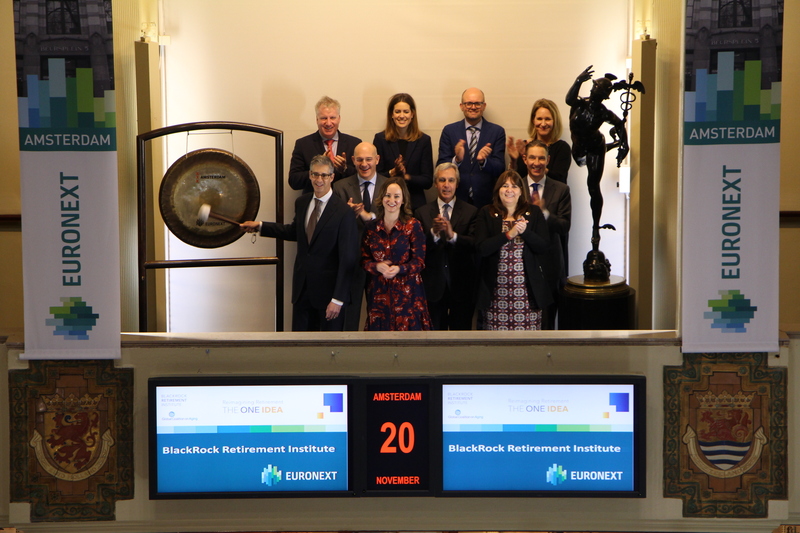 Bruce Wolfe, Executive Director of the BlackRock Retirement Institute, opens the trading day at Euronext Amsterdam by sounding the gong. He is accompanied by Michael Hodin, CEO of the Global Coalition on Ageing (GCOA) and Monique Donders, Country Manager for BlackRock in the Netherlands. To raise awareness for the retirement challenge and institute positive change, the BlackRock Retirement Institute (BRI) is organizing a discussion on retirement and longevity with its partner, The Global Coalition on Aging (GCOA). As the biggest manager for retirement assets in the world, BlackRock has come to view longevity and the related aging of our population as one of the most massive and profound trends shaping our social, economic and individual lives. In response, the BRI was launched in 2016 as a global thought leadership platform on retirement and longevity, dedicated to working with partners across society to develop solutions that will enable improvements both to retirement systems and individual saving’s behavior. The gong sounds for the Day of the Entrepreneur. MKB Nederland organizes this theme day together with INretail and other branches. INretail member and initiator of the lifestyle and coffee store ‘Hartje Oost’ sounds the gong. 17 November, is the Day of the Entrepreneur. MKB-Nederland, the initiator of this day, finds that entrepreneurs deserve respect for their commitment and feels that attention must be paid to the importance of entrepreneurs in the Netherlands. The Day of the Entrepreneur is the start of a tradition for celebrating entrepreneurship. INretail stimulates innovation in retail and presents its newest study ‘Retail towards 2030’ on the 20th of November. Once the results are published, the new SME device will be; learn today, do tomorrow. The Royal Dutch Mint (“Koninklijke Nederlandse Munt”) celebrates its 450th anniversary in 2017; coins have been struck in Utrecht since 1567. Mint master Stephan Satijn sounds the gong to celebrate this. The Royal Dutch Mint is the only producer of Dutch euro coins and combines 450 years of tradition with a focus on innovation. The organization leads the world when it comes to high value coins and other minted products. Innovative developments such as the laser and 3D technics make it possible to work with QR codes and micro texts on coins. The Royal Dutch Mint belongs to the worldwide top 5 producers of circulation coins, commemorative medals, tokens and collector’s items. In addition, Royal Decorations are also produced by the Royal Dutch Mint. Peter Sieradzki, CEO InsingerGilissen, and IDFA festival director Cees van 't Hullenaar open the trading day for the start of the world's largest documentary film festival. InsingerGilissen is a private bank that focuses on wealthy individuals and families, foundations, associations and institutional parties. InsingerGilissen offers private clients, in addition to independent asset management and investment advice, a wide range of private banking and wealth management products and services. The bank also provides specific services to independent asset managers. 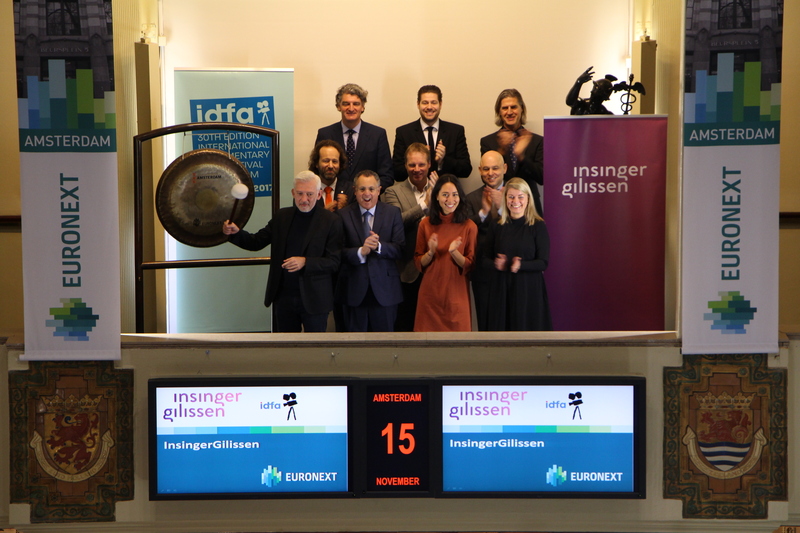 During IDFA (International Documentary Film Festival Amsterdam), the newly merged InsingerGilissen, presents itself as its main sponsor for the first time. During the festival, more than 280,000 visitors watch around 300 different documentaries. The annual festival starts on Wednesday November 15th and ends on November 26th. IDFA plays an important role in both the Dutch and international cultural landscape. 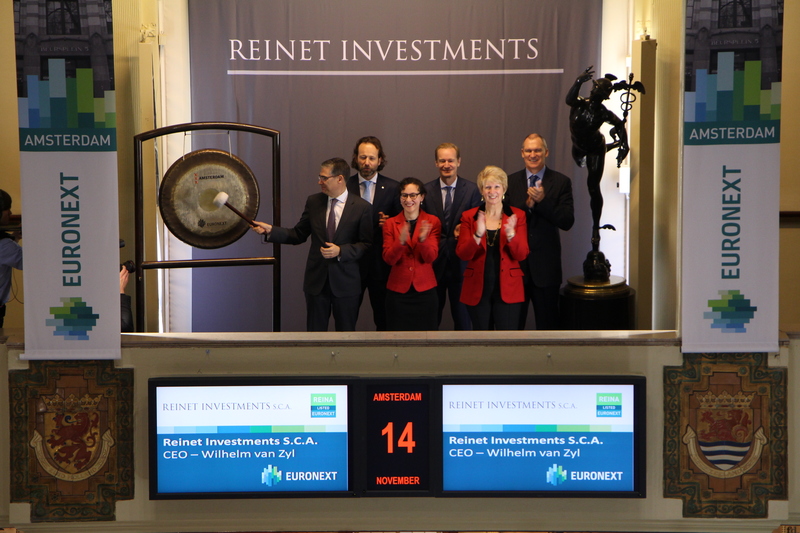 Euronext Amsterdam welcomes Reinet Investments S.C.A. Reinet Investments S.C.A. (ticker symbol: REINA) a Luxembourg-based investment vehicle, starts trading on Euronext Amsterdam. Wilhelm van Zyl, CEO of Reinet Investments, sounds the gong to celebrate the listing. Reinet Investments allows its shareholders to participate indirectly in the portfolio of assets held by its wholly-owned subsidiary Reinet Fund S.C.A., F.I.S. (“Reinet Fund”), a closed-ended specialized investment fund established in Luxembourg. 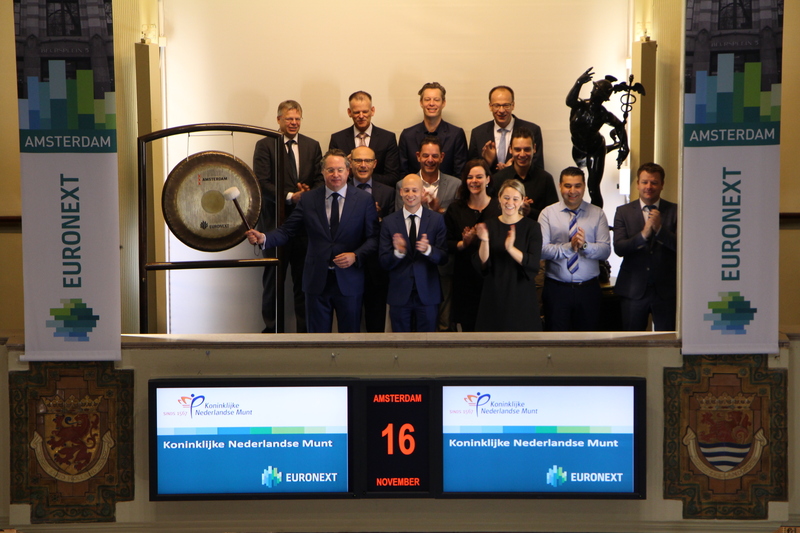 Euronext Amsterdam is broadly recognized for its diverse and international investor base and this new listing will provide Reinet Investments with increased access to European-based investors and will broaden its shareholder base. Tanja Roeleveld, Program Manager Sustainable & Engaged Business at Landal GreenParks, has been elected CSR Manager of the Year 2017 and sounds the gong on this occasion. 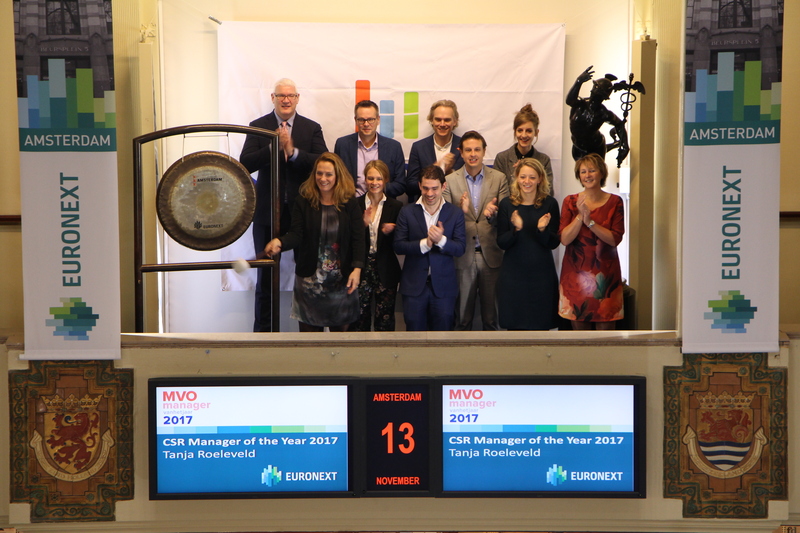 The CSR Manager of the Year election is organized since 2012 by CSR consultancy firm Sustainalize and Moonen Packaging. The purpose of the election is to recognize the extra efforts and results of qualified CSR managers. Roeleveld was recently elected CSR Manager of the Year 2017 at the Dutch National Sustainability Congress. A jury had previously nominated three people for this title. Besides Tanja, Niels van Geenhuizen, Program Manager Sustainability at Arcadis, and Geanne van Arkel, Head of Sustainable Development at Interface, were nominated. TRIPLE i sounds the gong in honor of the ‘Week van de Belegger’ (Week of the Investor) and the Beleggersfair (Investors fair). During the Week van de Belegger (10 until 17 November) answers are given to the rising demand of knowledge and information concerning personal finance. This will be done with activities throughout the country, inspiring programs and meetings. The focus is on education and information. 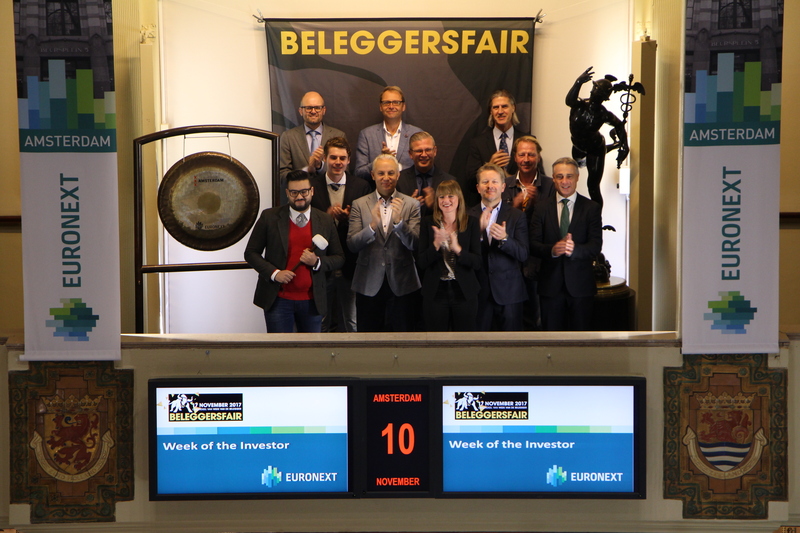 The Week van de Belegger closes on Friday 17 November with the BeleggersFair 2017 in the Beurs van Berlage in Amsterdam. 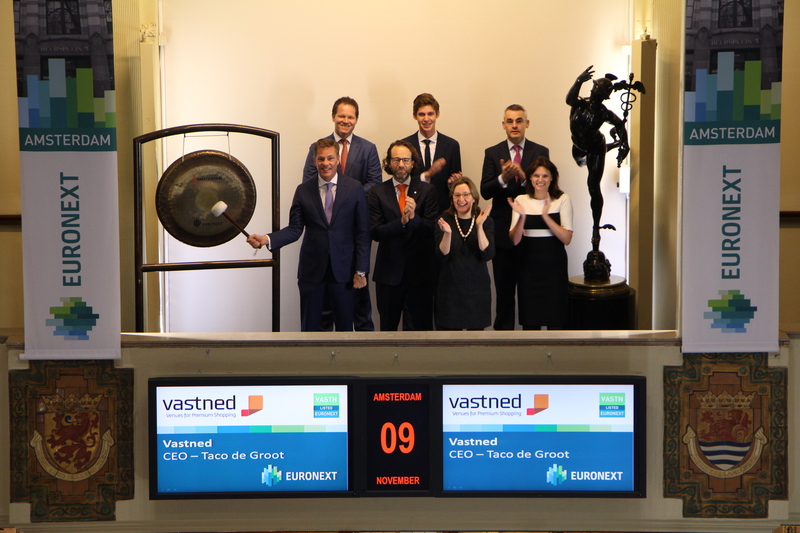 On 9 November it is exactly 30 years ago that Vastned (ticker symbol: VASTN) listed to Euronext Amsterdam. To celebrate this, CEO Taco de Groot sounds the gong and opens the trading day. Vastned is a listed European retail property company with a focus on ‘Venues for Premium Shopping’. Vastned invests in selected cities in Europe with a clear focus on the best retail property in the most popular shopping streets. Vastned's tenants are strong and leading international and national retail brands. From 6 November to 22 December, players can learn to invest. With a fictional amount of 100,000 euros, the game is designed to help people get acquainted with investment. Every Thursday, the TV channel airs a live report of the game at 10:45 featuring experts. Presenter Janneke Willemse sounds the gong for the start of the RTL Z Beursspel. The player who achieves the highest return after six weeks wins a wholly-payed trip to New York, including a visit to Wall Street. Two tickets to the Rijksmuseum are the prize for the best performing player of that week. The final of the RTL Z Beursspel is Friday 22. 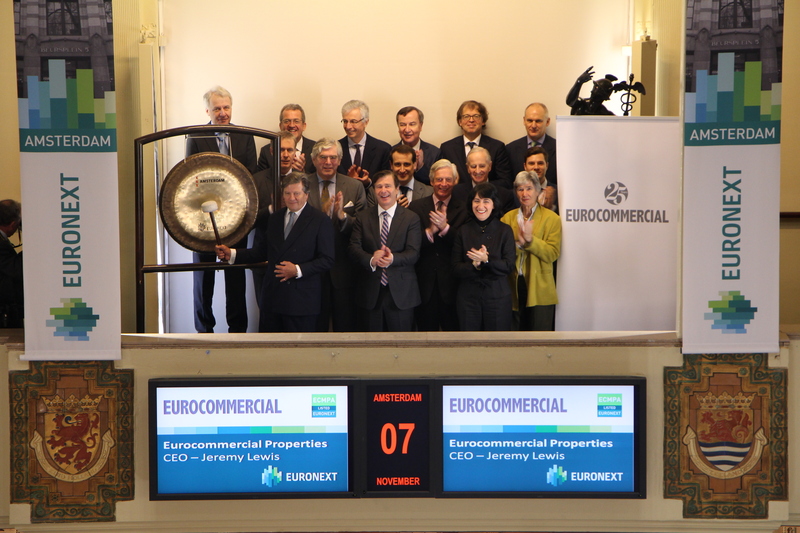 Jeremy Lewis, CEO of Eurocommercial Properties (ticker symbol: ECMPA), opens the trading day at Euronext Amsterdam by sounding the gong. He is accompanied by members of Eurocommercial Properties’ Supervisory Board and its Executive Board. Eurocommercial, headquartered in Amsterdam, is one of Europe's most experienced investors in retail real estate. The company celebrated its 25th anniversary in 2016 and since inception it has grown its asset base to over €3.8 billion, generating consistently rising dividends. At the Annual General Meeting, which will take place after the gong ceremony, the company will present its full year results for the 2016/17 financial year, which included a 3.7% increase in earnings; 8% growth in asset value and a proposed dividend of €2.10 per depositary receipt. 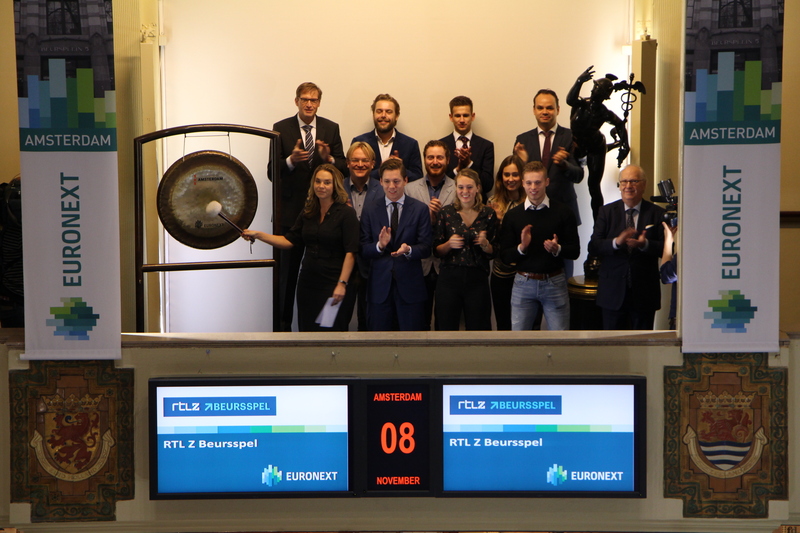 Euronext’s Amsterdam exchange is opened by the nominees and organization of the DAM Award 2017. 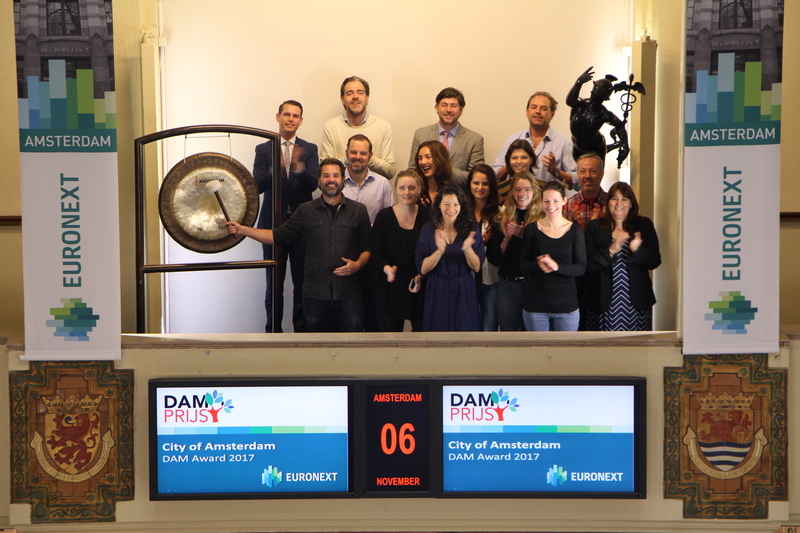 The DAM Award is the award for Amsterdam's most sustainable entrepreneur and honors long-term sustainable entrepreneurs. They are an example for other entrepreneurs and residents, by showing how you work together for a future-proof city. One entrepreneur is nominated for each city’s district: DGTL (East), DOOR Architecten (New West), LENS Energie (South), Metabolic (North), Plastic Whale (West), Vandebron (Center). The public voting, counting for 40 percent, is open until 21 November. The other 60 percent is determined by the jury on the evening of the award ceremony on 22 November. The winner will receive prize money and a publicity campaign for the company. 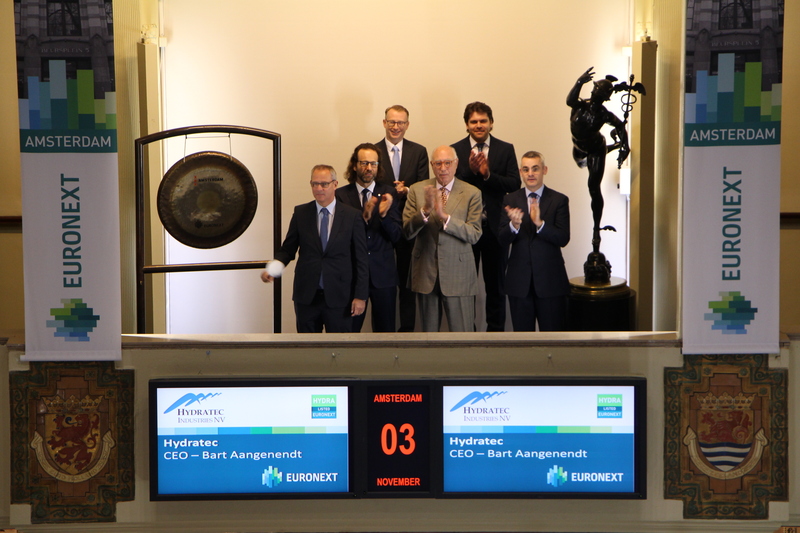 This year, Hydratec Industries (ticker symbol: HYDRA) celebrates its 20-years listed anniversary on Euronext’s Amsterdam exchange. On this occasion, Bart Aangenendt, CEO Hydratec, opens the trading day by sounding the gong. Hydratec Industries is a globally operating specialist in industrial systems and components with a focus on the Agri & Food, Automotive and Health Tech markets. Due to the growing world population and increasing prosperity, the Hydratec companies are well positioned. The organization has two core activities with each two companies. Agri and Food sector (Pas Reform Hatchery Technologies and Lan Handling Technologies) and the Plastic Components sector (Timmerije and Helvoet Rubber & Plastics Technologies). 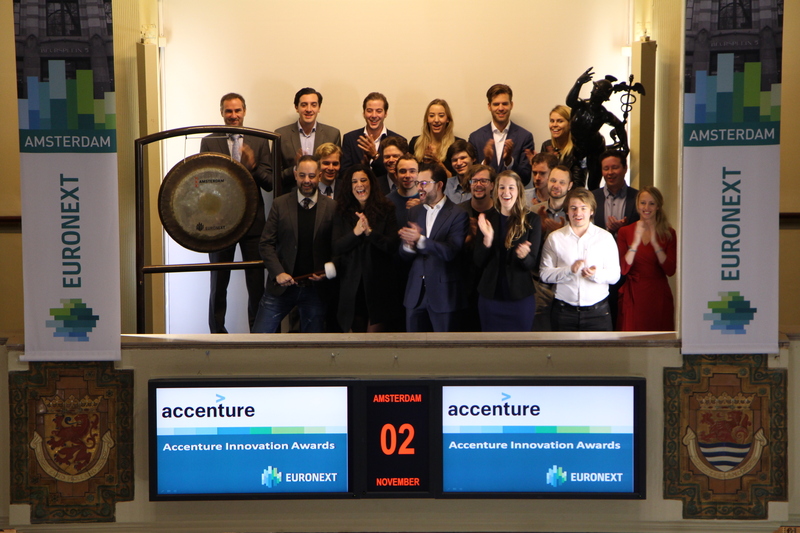 The ‘Financial Services Reinvented ‘ winner of at the Accenture Innovation Awards opens the trading day at Euronext Amsterdam. New technologies are rapidly disrupting traditional business models in the financial sector. The finalists in the Financial Services Reinvented theme have all shown the Accenture Innovation Award’s jury that they are able to use new technologies to their advantage.